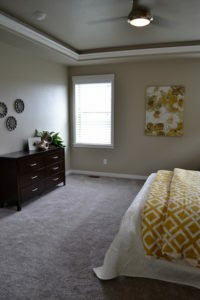 Creating a bedroom that is calming and relaxing is very important. It is the room you go to at the end of the day to unwind and get a good night’s sleep for the next day ahead. You can create a sanctuary for yourself if you follow these 5 simple steps. Use calming colors. Red may be your favorite color, but it is not highly suggested to go and paint your bedroom wall the latest shade of candy apple. It is best to stick with tones that will help you ease into a relaxing state of mind, such as colors with cool or neutral undertones. A beautiful blue would be a perfect choice, but if you prefer something a little warmer go for the latest trend of “greige”. You could always add in some fun accessories like throw pillows in order to bring you favorite color into the bedroom without going too far. Add blackout blinds. Daylight savings time isn’t always your friend. There are times of the year when it’s a little more difficult to fall asleep because the sun is up. If you add blackout blinds you wouldn’t know the difference (or at least not care). They are a wonderful way to quickly cut out the light that is keeping you awake. Get a quote and add these to your home. Get rid of the technology. This doesn’t fall under the design category, but it’s very important and I’m sure this isn’t the first time you’ve heard it. Television, cell phones, and other technology can disrupt your natural sleep cycle and take away the great night’s sleep you deserve. Decorate with soft textures. This is the place you want to lay down and feel instantly comfortable. That means go invest in some sheets made out of a fabric you like (silk, cotton, flannel — whatever makes you feel relaxed!). A nice cozy blanket for the bedroom is a good idea as well. If you want to create a soft look for the bed then consider purchasing an upholstered headboard and don’t skimp on the pillows. Add something soft below your feet. Nobody wants to put their feet on a cold floor before they’ve even had their morning coffee, which is why it’s very common for the bedroom to have carpet. It’s a great way to create a calm space, but if this doesn’t work for you then consider adding a large throw rug in the room. These 5 steps are easy ways to make your bedroom a comforting place to rest your eyes at night. Add some candles and personal touches and you may never want to leave.